Sharon has owned and operated Successful Resumes Rockingham WA since 2008. Through her professionalism, personalised services, passion, commitment and winning resumes Sharon has assisted hundreds of clients to secure that all important first interview. Sharon’s employment background spans a range of industries from legal, not-for-profit and construction to public relations and tourism. With expertise in human resources management, recruitment, organising and conducting training programs, preparing legal documentation and the intricacies of finance and project management, Sharon uses her experiences to create winning resumes / CVs, cover letters and LinkedIn profiles. 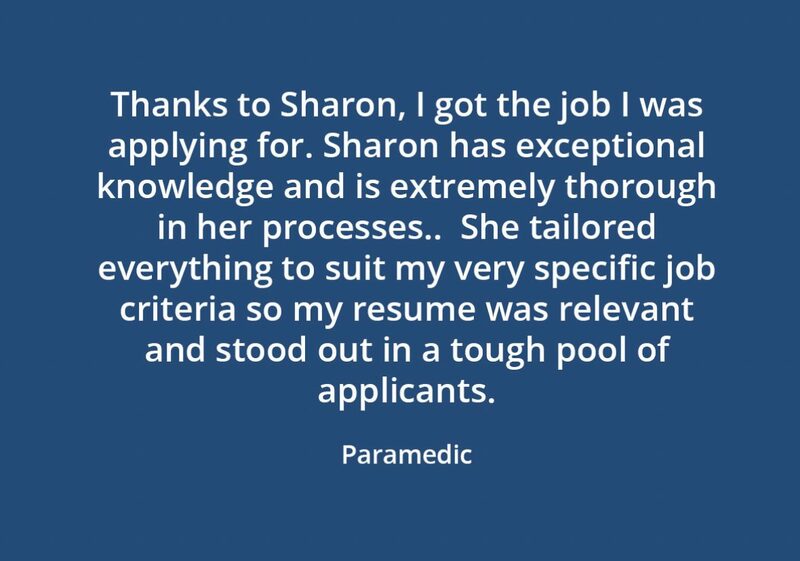 CLICK HERE to read a selection of testimonials Sharon has received from clients. Sharon’s knowledge of the dos and don’ts of applicant tracking systems can assist clients to increase their resume chances of getting through the minefield of ATS. Application tracking systems (ATS) are systems used by employers and/or recruiters to manage job openings, and screen incoming resumes. It is estimated that ATS kills 75% of candidates’ chances of landing an interview because of the low ranking the application tracking systems give the resumes. A cover letter can be as important as the resume. The aim of the cover letter is to introduce yourself and to convince a prospective employer that they should interview you. A cover letter allows you to target the job and the employer, leaving the resume to market your skills, qualities and experience. LinkedIn is the world’s largest professional Network on the Internet with more than 20 million professionals including recruiters, hiring managers and decision makers using LinkedIn to post job vacancies and to search for candidates. As a jobseeker having a professional LinkedIn profile enhances job seeking footprint. 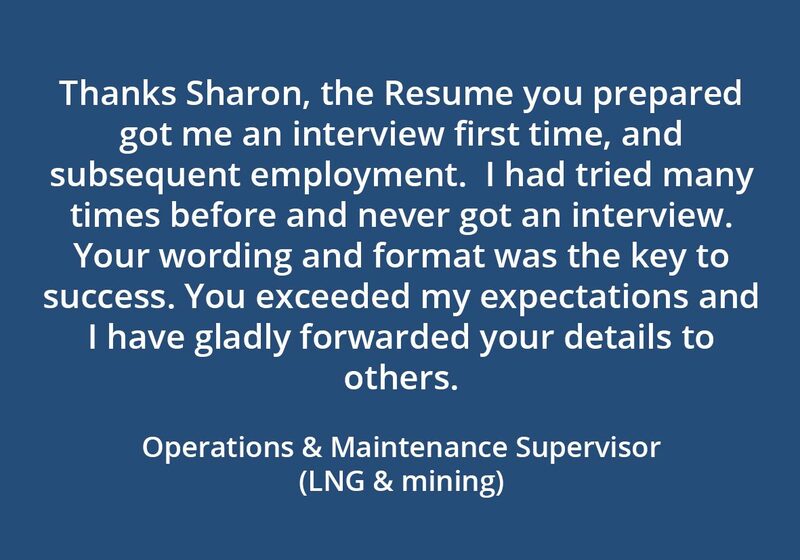 Thank you Sharon the resume you did for me was great no problem with finding work, I am on my way to Wheatstone ING project. There was no stone left unturned when it came to her professionalism, Sharon provided some amazing suggestions, she translated my ideas into a content that I would never have thought possible, my resume was nothing short of fabulous. I submitted my new resume the day after receiving it and was accepted for the position. I am extremely grateful to Sharon for her amazing effort. 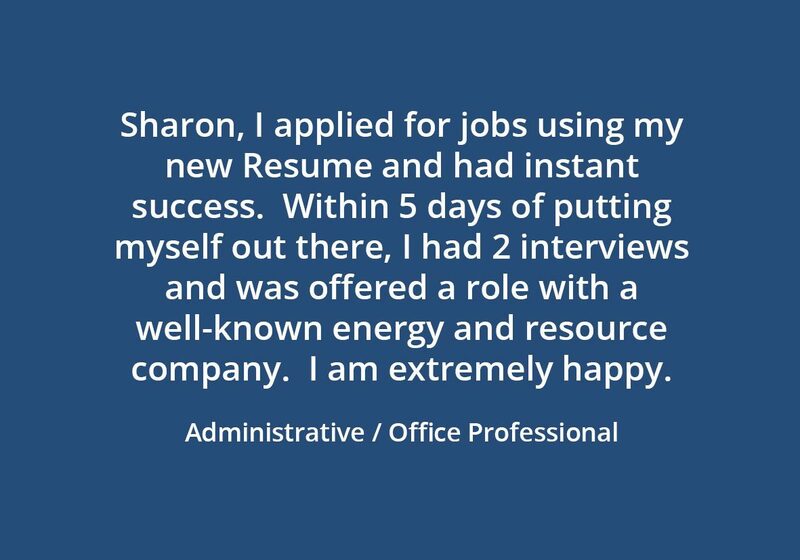 Thanks Sharon, the Resume you prepared after the 90 minute face to face meeting resulted in an interview first time, in my chosen field and subsequent employment. I had tried many times before and never proceeded to an interview. I believe your wording and format was the Key to success. You exceeded my expectations and I have gladly forwarded your details to others including my Son. 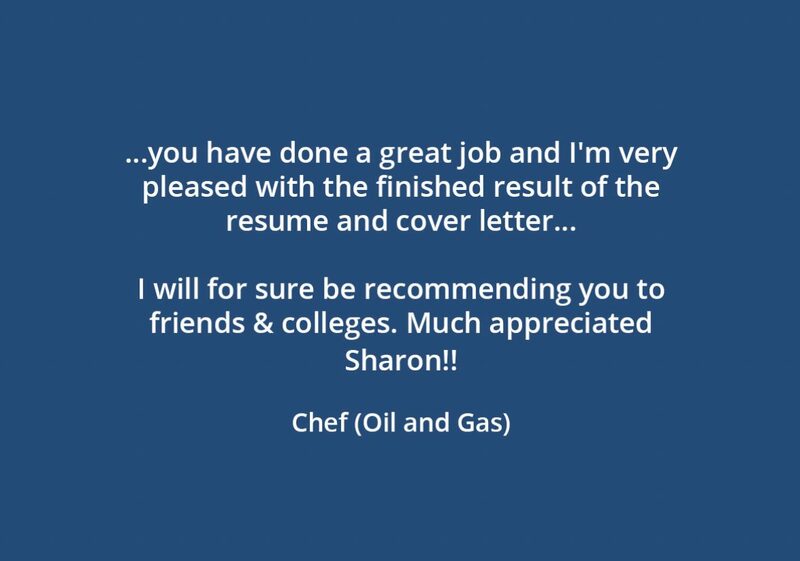 It is thanks to Sharon that I was able to achieve the job I was applying for and I would like to pay credit to her for that. 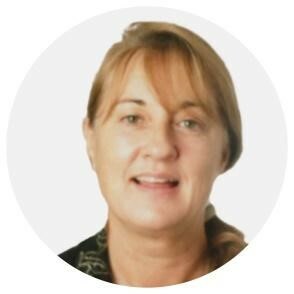 Sharon has exceptional knowledge in a number of industries; she is extremely thorough in her processes to achieve the outcomes you are looking for. 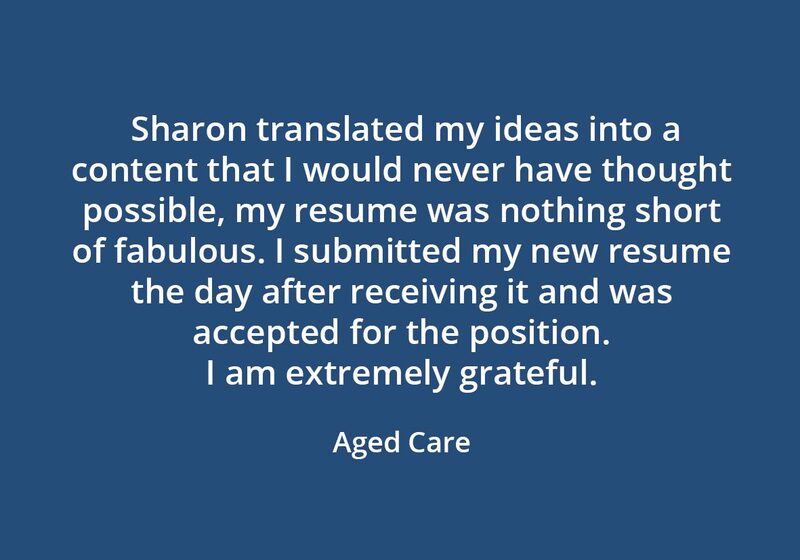 Sharon was able to tailor things to suit my very specific job criteria by ensuring my Resume/CV was relevant, yet stood out in a tough pool of applicants. I would like to add that I have returned to see Sharon to make sure my Resume/CV is kept up to date in both details and appearance to enable me to keep furthering my career. I’ll take this opportunity to let you know that I think you have done a great job & I'm very pleased with the finished result of the resume, cover letter & how we dealt with the whole thing. I will for sure be recommending you to friends & colleges. Much appreciated Sharon! !